With two adults, a large dog, two overweight cats, and one active toddler, our 1200 square feet house has reached its maximum capacity. Yet, this especially cold winter has encouraged a few visitors to ignore our “no vacancy” sign, and move in anyway. Our first unwanted guest arrived shortly before Christmas. Not expecting company, I went about my evening chores on auto-pilot. Freshen the pets’ water. Feed the cats. Walk the dog. Feed the dog. To break up the monotony of the routine I let out a shriek while feeding the dog. I am not afraid of mice. 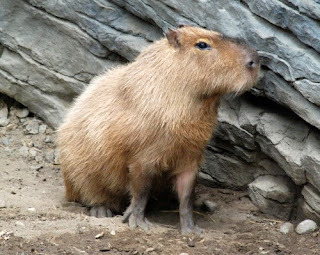 I like rodents. 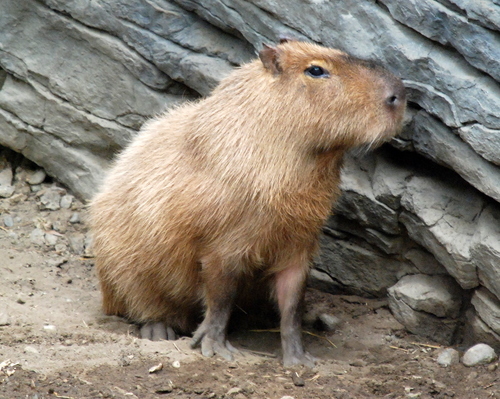 The capybara is one of my favorite animals. I had pet gerbils, Guinea pigs, hamsters, and mice as a child. When Ezra is old enough to want a pet of his own, I have often thought a rat would be a good choice. What I don't like is blindly reaching into the dog food container to feed Piper, looking down, and realizing my hand is inches from a wild animal. Even if that wild animal is a healthy, well-fed, happy looking little mouse. Once I recomposed myself, I returned the visitor to the woods behind our house where he apparently told all of his friends about the Promised Land – our pantry. As a few more mice have continued to leave signs of their presence our cats, Stella and Grace, are starting to look bad. They were once pretty good at killing the rare stray mouse and keeping the others away. Lately, I know a mouse is in the house because the cats immediately start bickering over the details of how the mouse should be dealt with and by whom. Once mousers, the cats have turned into bureaucrats, and while the mouse problem is held up in committee, the mice themselves are roaming our house and eating our crackers. Realizing I was no longer able to depend upon the cats, I took matters into my own hands and bought a catch and release trap. Bringing the trap home seemed to either motivate or embarrass the cats as they have since caught one of the mice. Including the Christmas mouse, I have caught 3 (though one escaped). Our current scorecard is: Grace/Stella=1; Garry=2; Mice=1. I hope the game ends soon.